Back in 1983 I was asked to work on the construction of a Stonehenge monument to be built on the campus of what is now Missouri University of Science and Technology. The new Chancellor of the campus, Dr. Joseph Marchello, had helped establish the Center for ArcheoAstronomy at the University of Maryland. 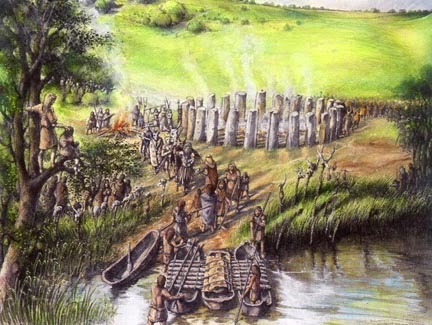 He had wanted to build a Stonehenge, and we had just developed a new way of cutting rock with high-pressure water, and had contacts with the Georgia Granite Association as a result. The monument, which ultimately consisted of 55 different stones, was designed by Dr. Joseph Senne, who was then Chair of the Civil Engineering Department on campus. 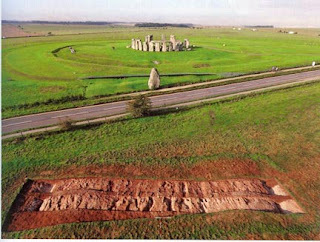 But to understand why we built ours, one has to understand why the original was built, on Salisbury Plain in the UK, some 5,000 years ago. And this discussion has been helped by the new book “Stonehenge – A New Understanding” by Mike Parker Pearson, discussing the recent Stonehenge Riverside Project. 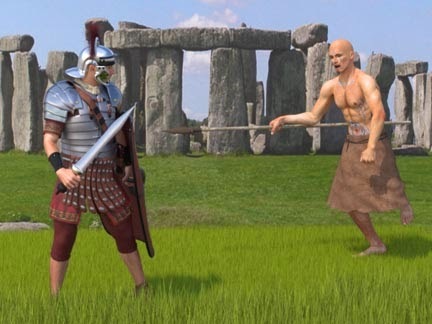 Although there are legends that it was built by the Druids, they actually came after the circles had been built, and it should be remembered that, when the Romans came to the UK 2,000 years ago Stonehenge was already over 2,500 years old. In looking back on that period remember that the history was written by the Romans and that they had to justify their invasion. Thus the picture that they paint of British society at the time is colored by those needs, and their image of Druids as backward painted savages is unlikely to be close to reality. But why was there a need for these circles? 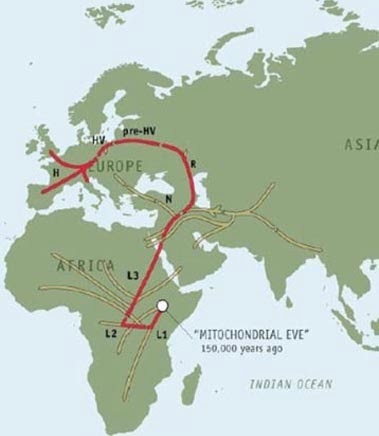 Well back some 50,000 years ago mankind had migrated out of Africa and slowly spread through Europe and Asia. 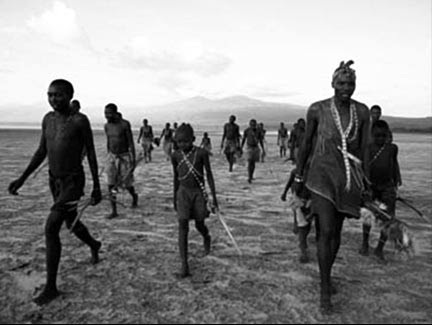 But as they spread they originally retained their cultural structure as hunter-gatherers. They reached Spain and Portugal as Cro-Magnon man, but were still largely hunting and subsistence gathering at that time. Such groups are small, typically, as one sees with the Hatzabe in Africa today, they number around 20 individuals. Figure 4. The Hatzabe a family group of about 20 individuals. 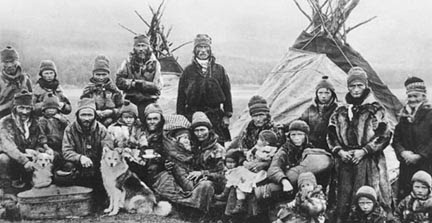 The group size is similar with the Sami in Scandinavia, families that still follow the herds of reindeer as they have done for millennia. Such tribes (including the Bakhtiari of Iran that Bronowski documented in “The Ascent of Man”) are migrant, and do not have time for much other than staying alive. But, with time, the culture changed and people began to farm. This change began around 12,000 years ago, likely in the Middle East. 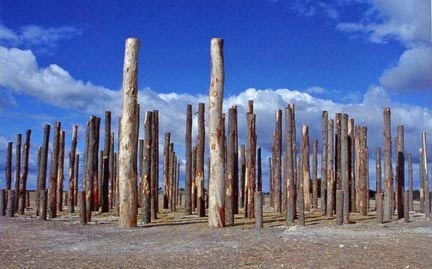 It was not until 6,500 years ago (4,000 BC) that trees began to be cleared and farms established in Southern England. One of the advantages of farming is that the tribe does not have to move continuously to sustain itself. Cronon, in Changes in the Land, notes that in non-agricultural Maine the population was sustained at around 41 persons per hundred square miles. With the beginning of agriculture further south in New England (pre-European arrival) the native peoples could sustain 287 people in a similar area. More intense development of crops and the domestication of animals followed, leading to larger and more closely knit communities. But there is one problem with the switch to agriculture on an increasing scale, one needs to know when to plant the crops. And while initially this was likely imitative of nature, over time the tribes needed to develop a calendar. Lying by the fire and staring up at the stars to work on the idea Neolithic Man was living in what we now call the end of the Stone Age. And they noticed that at different times of the year the moon lay at different points in the sky. And so they started to plot these positions, after a while they noticed that there were grooves on some of the local rocks, left from earlier glaciation, that aligned with the positions of the moon at mid-winter and mid-summer. This led on to marking the positions of the moon (and possibly also some of the stars as was the practice in native tribes in America). These markings were made more permanent as they were more confident of their positioning, through the use of wooden poles. 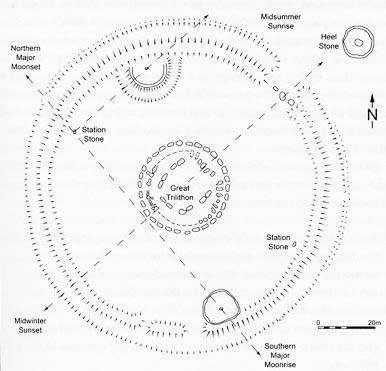 (Note that there is a similar though more primitive wooden circle at Cahokia in Illinois dating at around a thousand years ago). The village grew into the town of Durrington Walls, with wooden houses, which have been recently excavated to show the yellow-painted clay floors, and the location of beds, dressers and other wooden furniture. 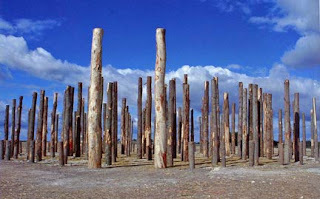 With confidence, and as the calendar became more reliably used, so the wooden poles were replaced with a more permanent set of bluestone columns that had been brought to the site up the river Avon. There is a little controversy over what happened next, but it has been suggested that around this time a new set of folk, now known as the Beaker people, because they used clay pots with a spout (beaker) moved into the region. They had one critical difference to the earlier site inhabitants, in that they worshipped the sun, rather than the moon. Thus the old calendar would not work. But up where the grooves cut into the stone, they had set four stones (the Station Stones) into the ground in a rectangle to mark the position of mid-summer and midwinter moonrise. If you rotated around the stones ninety degrees, then these poles still marked the two days, but now they did it for the sun’s positions. This could not have been a co-incidence, and so the study of calendars proceeded, but at the new site, further up the hill at the current Stonehenge. 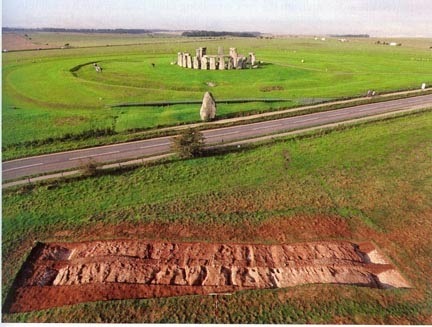 And on a passing note, as I once mentioned in Nature, and Rodney Castelden noted in “The Making of Stonehenge” the rocks were likely hauled into place with oxen, which might be why the roads are so wide). 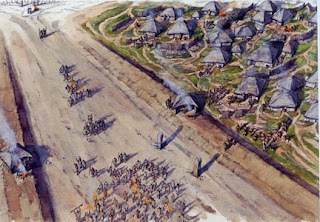 The first major construction at the Stonehenge site was the surrounding ditch and mound of rock (which is a relatively soft chalk that can be excavated with antler picks) with a series of small pits (some of which have been found to contain human remains) set within the ring. There has been discussion as to whether this was a ceremonial burial ground for high-ranking individuals. In much the same way as Bruce Bourque has noted in “The Swordfish Hunters” discussing the Red Paint People of Maine, the small number of burials, relative to the size of the local population and the length of time this existed, means that this could only be a special place and rite. So though it might be where high class folk were buried (as with Westminster Abbey) it had other uses, which was to develop the calendar. Over the years a number of different circles, with a variety of pole positions, were tried. For a while the 28 and a half stones of the Sarsen Ring had favor, but the last stone circles they put in had nineteen stones (probably taken from the Bluestone ring at the bottom of the hill). Then they stopped. They had a calendar. But why nineteen? Well nineteen times nineteen is 361. Add the four days when, in the Hyperborean calendar, “time stood still”, which have come down as the Celtic feast days Samhain, Imbolc, Beltane and Lughnasadh, and you have a remarkable resemblance to the 365 days of the year. The problem was solved for a couple of thousand years. Until, of course, those pesky Romans showed up, and made us work with months of 28, and 30 and 31 days. Herumph!! 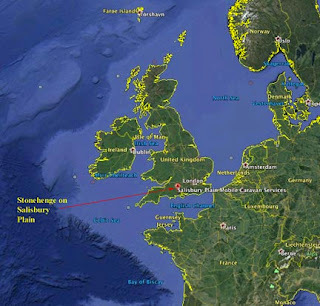 I’ll talk about the Building of the MS&T Stonehenge next time!. Did you know you can shorten your links with Shortest and make dollars from every visitor to your shortened urls.